Over the many years that I have been using PCs and Windows, I’ve never played much with its Screen Saver function. All I’ve done is set the Windows’ wallpaper as one of my photos. When my screen saver would kick in, my screen would go blank. Using the screen saver was important a few years ago. Otherwise, you might permanently burn in the writing etc left on the screen for an extended period. That is not generally a problem with today’s monitors. What have done is select one of my pictures as the Windows’ wallpaper. This is easily done within PSE’s Organizer. First select your desired picture. On the Menu, click on Edit > Set as Desktop Wallpaper. Now your desktop background is your photo. The other day I decided to see what it would look like to have the screen saver display a slide show of some of my images. I was quite impressed. The image backgrounds, layouts, and special effects were quite impressive. I discovered I had been missing a lot by not doing this far sooner. I saw photos that I had not viewed in years. Here’s what I generally did on both my Vista and Windows 7 PCs. Click on the Start button and then select Control Panel. In the greenish area on the left, click on Change Screen Saver. 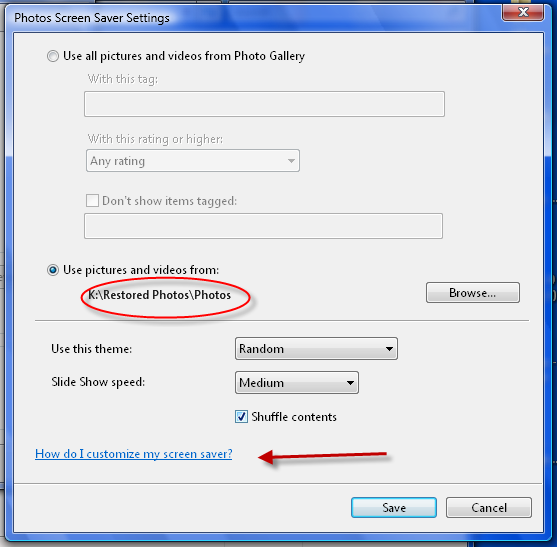 In the dialog that opens, select Photos and click on Settings. Navigate to the main folder that contains your photos, for many that will be the Pictures folder. Set the other options as desired. Click Save and then get a cup of coffee. When you return you should be looking at a nicely designed slide show of your image library. There is also a link to find out more about customizing your slide show as shown in the figure below.